We had such a good time camping at Manning last year, we decided to do it again this summer! 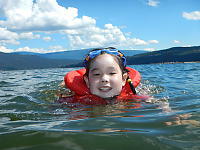 I was originally hoping to go to the Okanagan, but reservations are really hard, Shuswap was open and I had never been. Perfect combination! We left Vancouver Monday morning (Helen worked the weekend) just after 11am and started driving inland. We stopped at Bridal Veil falls for lunch. Every time I drive though Merritt I take in the grasslands covering the surrounding hills and wonder what is up there. I did a bit a research and it turns out there are actually quite a few places you can get off the highway and explore the grasslands a little. On this trip we decided to visit the Laurie Guichon Memorial Grasslands Interpretive Site. It's a bit tricky to find - you turn off the Coquihalla and start driving toward Kelowna. There is no sign at the turn off, but shortly after you get off the highway (there is a left turn bay) and onto the gravel road there is a welcoming sign and a map. What I noticed first getting off the highway was the large Osprey Nest on an artifical platform on top of an old snag next to small lake. It was a busy nest - three almost full sized juviniles with two parents coming and going with fish. Helen noticed something a lot more subtle - a sapsucker (think woodpecker) excavating in a nearby tree. I knew this was going to be a good stop. We drove a little further down the road to Marquart Lake. It's been a cool/wet summer so there was still lots of green left in the grasslands. I was surprised just how many flowers and insects were around. I was keen to see the dragonflies and butterflies because the dry interior has different species than the wet west coast. When I started researching what was actually in the photos I was quite dismayed to find that much of what I saw was actually invasive/introduced species. Merritt is not a great example of pristine grasslands and nature being what it is, you can't remediate the land to back to an earlier state. The campground has a lot going for it - large beach access, paved roads between camp sites and a nice staff running the facilities. Sadly, it didn't have much for amphitheater programs. The only program was the Tuesday night "Learn to Fish" program put on by the Freshwater Fisheries Society of BC. The brought a truck full of pre-setup rods and gave a nice presentation about stocking lakes, invasive fish and fish we need to protect (like Sturgeon and Steelhead). They taught the kids how to cast their rods and then set the crowd on the beach to "go fishing". The rods the kids were given had just a bare, barbless hook - no lure of any sort. The kids basically didn't stand a chance of catching a fish. It didn't help that they were fishing in the swimming area at the beach which I find it hard to imagine a fish would want to live in. The kids didn't know any of this and had a great time casting into the lake. Some kids were standing in the water and of course all kids wanted to copy - ours only got ankle deep. I'm now willing to call myself a "birder" - there is no way I could argue any other way. When I did the research on where to go, the Wharf in Salmon arm showed up as a good place to Grebe's that I hadn't seen before. Combined with lunch in town, it made for a nice morning trip. Right off the wharf is a family of Osprey raising three chicks. The birds all look good and must be pretty naturalized to people. Boats come and go (there is a fuel station at the docks) and the birds didn't seem bothered. I setup my camera as a telescope and the kids got to see the eye colours of the big birds. More subtle was the Western Grebe's. These birds aren't common in the lower mainland, but they were easy to see from the wharf. With the boat traffic, the boats weren't close to shore, but their white necks really stand out so you can see them a long way away. I really enjoyed the walk around the grasslands in Merritt so I decided to do a little more! Just North of Kamloops is a the Lac Du Bois Grasslands Protected Area - an area of rolling hills where grass and sagebrush dominate the landscape rather than trees. I may have gone once as a child (I used to live in Kamloops) but I don't remember the area so today was mostly a scouting trip. One of my favorite plant books has a "Southern Interior" edition, highlighting the plants found away from the coast. Grasses dominate the book. Walking around the grasslands protected area, you see different specialization - valley bottom grasses are different from grasses on slopes which area different again from grasses in shade. Now that I have some idea what is out here, I can plan a better trip in the future. When I was a kids, I went to Sunnybrae Bible camp for a week each summer. My sister generally went a week earlier or later. Just down the road is Margaret Falls so I'm sure I visited at least once. Sadly, I have very little memory of this place. The falls are quite dramatic. There is a cave under the waterfall and we watched a barefoot guy walk in a walk out. Of course the rock is covered in slimy algae so walking on it is taking your life in your own hands. 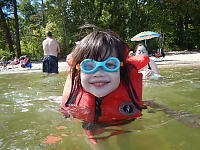 It's amazing to me how durable kids are to swimming in cold water. Last year we went camping at Manning park and the kids went swimming every day in a lake that is covered in ice every winter. The Shuswap doesn't freeze over any more (apparently the last time was in the 70's or 80's) but I wouldn't describe the lake as warm. The kids would swim until their lips went blue, come to shore to warm up in the sun, and go swimming again. I'm keen to see what kinds of animals can live in a provincial camp site. There were two deer that wandered around campsite to campsite eating the under story plants. We saw a few squirrels wander through. I saw a pileated woodpecker once. My favorite sighting was a Merlin, high in the tree tops across from our site. I was out on the road with my camera taking photos when a family with young kids walked by. The youngest said I had a telescope. The parents said yup and just kept on walking. I've said before, I'm not a big fan of campfires. They are smokey, smelly and have a risk of burns. My kids love campfires. On the second night we bought a bag of firewood (about twice the wood you get from from a gas station for the same price) and made a campfire. We brought a hatchet which allowed us to break the large pieces into pieces a good size for starting a fire. Helen purchased a bunch of glow sticks at the dollar store a few years back. Sadly, they do have a shelf life and some of them don't make much light at all. After a few bad sticks, we decided to open all of them and decorate the tent. The combination of flashlights, glowsticks and campfire smoke was a great combination for the kids. I was hoping to take photos of the stars or even the milky way, but the moon and clouds really didn't help out. When I woke up early for my Lac Du Bois trip, I was surprised to find that I didn't need a flashlight - the full moon was so bright it was almost like daylight. The moon rose early in the evening and stayed up all night so there was never a good time to try and photograph stars. And then it was time to go home! We took down the tarps, packed up the tent (amazingly, everything fit back in it's bag) and repacked the car. Our little Subaru was packed tight - the kids couldn't see each other in the back seat and the space beneath their feet was full. And we were off home! Lunch at White Spot in Kamloops (first free internet in days!) and after wait through an accident on the Coquihalla, home again.